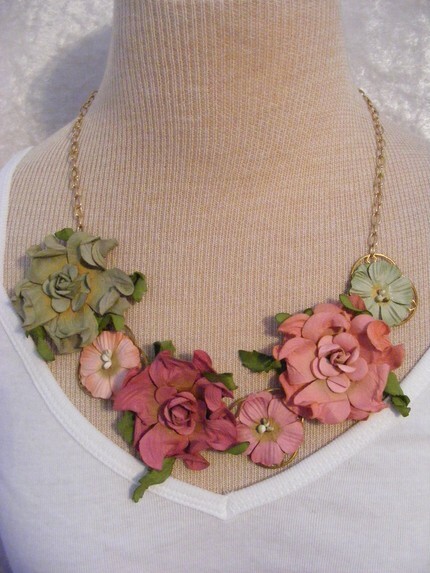 While wandering around Etsy, I came across two pretty paper necklaces, perfect for spring. They're not at all the same, but each has a soft, vintage-y look that's so very current. 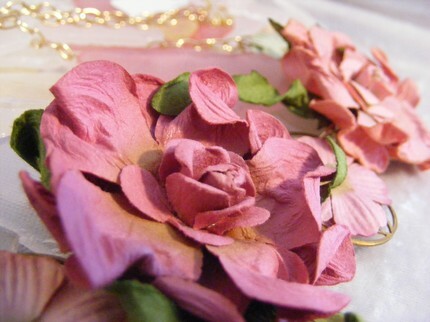 Lovely, textured paper flowers from the scrapbook section of a craft store transform a plain brass necklace. 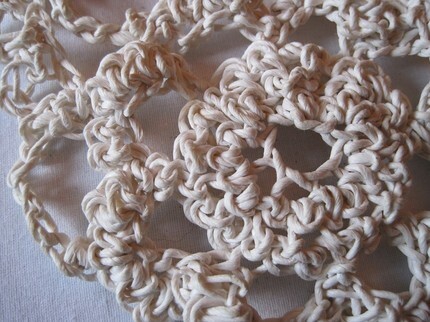 They're glued onto the circular links and the piece is finished with a gold-plated chain and toggle clasp. Two sisters from Ohio make the mostly one-of-a-kind jewelry items that are available in their CMandMJewelry shop. I've been seeing a few intriguing mentions of paper string recently, and was happy to spot a beautiful example in River Aurora's shop [edit: no longer available]. Jordana creates unique wearable art in Savannah, Georgia. 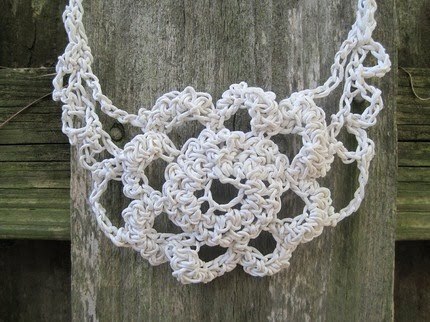 This hand crocheted lace necklace is a treasure. The flower necklace reminds me of the film version of Anne of Avonlea, in which Anne Shirley wears a paper necklace of flowers in similar colors. The flowers aren't the same, but it brought it to mind, anyway! Well, my sister just insisted that the necklace was actually made of real flowers.... and now I suppose we'll have to break out the movie to prove one of us right. is that really paper??? The necklace is beautiful. Have to check them out... Thanks for showcasing that. The paper strings are unbelievable. Both very pretty. I come by way of Tara, Jordanna's mother. Mary, I'd forgotten about the flowers that Anne Shirley wore; good movie. Constance, thanks so much for visiting and introducing yourself.